Miata LFX Swap (Singular Motorsports & Good-Win Racing) - Page 9 - Miata Turbo Forum - Boost cars, acquire cats. Why add more weight than needed? Reliability and drivability. Reading Camaro forums a lot of V6 guys want to swap to the 6060 because the second they start modding they start grenading synchros. I answered my own question during my research though, according to the Camaro forums the bellhousings don't match up and nobody has put the time/money into getting adaptors and clutch kits made. There's some hope that the ATS-V's 6060 will swap in as they used the LFX block as the core for the TT3.6 in there, but until those parts start showing up online there's no way to know. From what I could tell looking at the option codes, that application list is quite outdated and applies to the AY6 in general, and not the MV7 specifically. But thanks for the replies. I've been submerged in Mazda engines going back into the 80's so trying to learn the ways of GM and their massive family of parts-bin style manufacturing has been a little overwhelming. I'm sorry if this is another simple question but I'm not sure if it has been answered, is there a reason that nobody has used the T-56 or TR-6060 with the LFX? Those seem to be really widely available and can hold more torque than the AY6 if you decided to start modding your LFX. A good tune, Mace cams, and well built exhaust can come fairly close to the AY6's quoted 345 lbft max. I'm guessing the bellhousing is different? Very simply, connect the transmission that works with the engine and that will handle the horsepower, and won't require an adapter. The list gives a good start, but it sounds like you already know where to look. Otherwise, keep it simple. As Cord said, the MV7 isn't necessarily "better", it just offers an alternative for 1/2/3/4 ratios. I ran the numbers on the MV5 and MV7 with the various final drive ratios available and considered the racetracks I'll spend the majority of time on, and theorized that MV7 would suit my use better, but that is still just an educated guess. You have to realize what most of those Camaro guys are doing quarter miles. (Most not all). A 4000lb car with a good launch is going to be much harder on a driveline than a miatas application. Generally you break synchros bang shifting, not double clutchin like you should.. erm.. and they probably want the tr6060 for the same reason they really should have gotten an SS with an LS3. Speed costs money, how fast can you afford? Our MV7 was just shy of $1100 to our door - LKQ is one of the larger franchise yards (a little bit more expensive) and we opted for additional warranty (just in case). But you'd be lucky to find a (fbody) T56 with < 200k miles on it for less than $2000. I finally found my GTO T56 for $1700, two states over, with 120k miles, with a rebuilt tail housing and no core charge. It only took me 9 months to track down. T56's and 6060's are available but not always affordable. As far as weight.. both the AY6 and T56 are both pretty stout. And I can't give you exact weights, I just know I wouldn't want to lift either one over my head and try to stab the pilot bearing whereas I could do that all day long with the miata. And the MV7 has always been a little rare, especially compared to the mv5. How many cadillac owners would you expect to shift their own gears? I guess I probably should've been a little more clear with my intentions. My build planning is meant to be streetable. The low mileage reliability and good aftermarket value of the LFX is my reasoning for looking into this route. So while you guys are worried about 2-4, I am more worried about 1st and 6th. Keeping my wife on the good side of me building the car requires that she not be afraid to drive it and I am a little concerned the super short 1st gear would make streeting this engine difficult. The 56 and 6060 have really long 1st and 6th gears that make them quite tame by comparison. That is why I was so curious about if they would work. Part of the problem is there is barely any of these swaps in the wild so the discussion of 'can it daily?' Just hasn't happened yet. I know the LS swaps can daily when done correctly, but I don't have $25k to hand over to FM and LS1 power for 1/3rd the price is a mighty fine proposition on paper. "Will it daily" - https://www.miataturbo.net/build-thr...x-build-87186/ hopefully we'll find out in 2 weeks. (We're currently at the everything is 2 weeks away part.. last week we were 2 weeks away, next week we might be 2 weeks away). We went with the MV7/3.23 on the recommendation from V8Roadsters and I'm fairly confident it will daily. We've kept the aftermarket mods down to a vitesse throttle controller and a catch can, pretty sure 300ft/lbs everywhere is enough smile fuel. Super short 1st shouldn't cause too much concern unless you get on the loud pedal too aggressively, otherwise it's just a stump puller and annoying to shift 1-2. Though it does make me wonder if HPTuners has a torque limiter based on gear available.. I'll have to start poking around there soon. These are my expectations. I hope I'm right. With the LFX setup you've got a completely bulletproof, understressed drivetrain. You could stop by your local 1/4 mile strip every day on the way to work, and this drivetrain wouldn't even blink. And since it's such a tall first gear, you should definitely tell her to drop the clutch at 4k rpm's whenever she's at a stop sign. I'm kinda of angsty about this build coming into existence just as I get my turbo car up and running again. The idea of a daily driveable, 100k mile reliable miata with 300whp sounds really incredible. Oh **** and it's even CARB legal, isn't it? If it can be made anything close to the same ballpark as a turbo build, I could definitely see doing this as a future project. 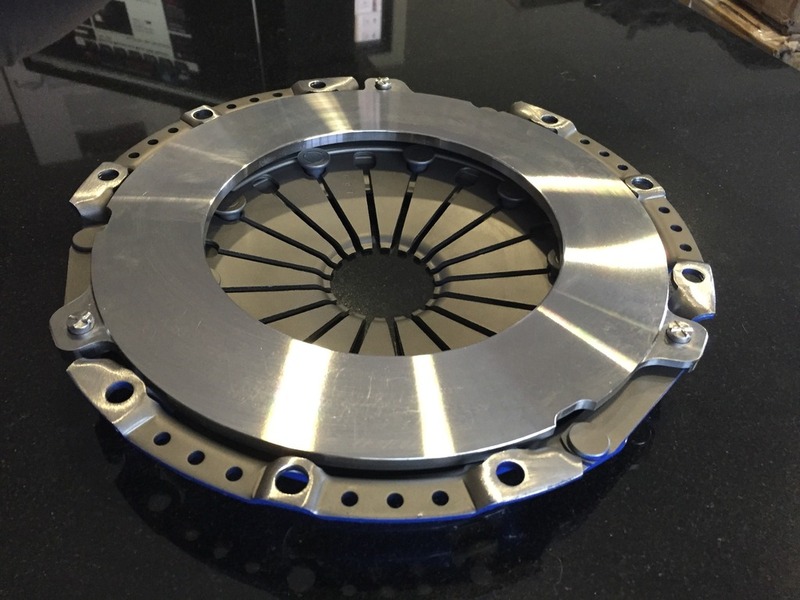 4+ months spent working out details for the custom flywheel/clutch for this project, and then at the eleventh hour - right before the flywheel gets CNC'd - they double-check a measurement I had sent over right in the beginning and they realize they won't be able to build it. Facepalm. So... looks like SPEC is my huckleberry. Wasn't my first choice but beats putting a 50+ lb stock combo in there. 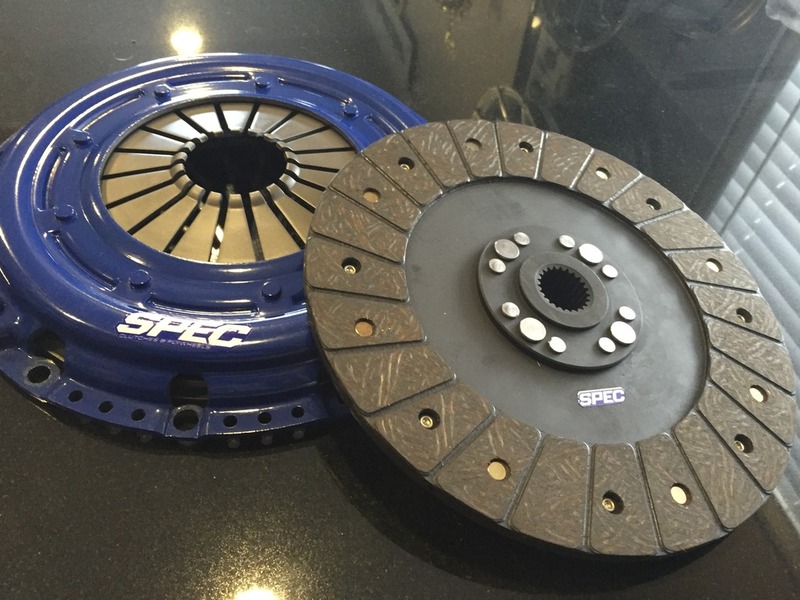 Spoke with them today about the options, because the car doesn't use a pilot bearing they recommend a solid hub disc over sprung, and based on that they recommend a full face disc over pucked so that it's not entirely an on/off switch. Me too. This is supposed to be discovered after the part has been machined and delivered while attempting assembly. What's with this "double-checking"? It certainly could have been worse. For the record, all the measurements on my end were correct from the beginning. Turns out the person on their end who had been handling this project with me overlooked some of the details in those measurements that he should have caught much earlier. Someone else checked the numbers and threw up a flag. Bottom line, they can't make a clutch for this engine. Last edited by ThePass; 02-09-2016 at 11:16 AM. Who have you been dealing with at SPEC. They get a bad rap among some groups, but I have found their products to be well designed and engineered, and their customer service to be excellent. They also go out of their way to support the local street car kids, which pleases me. PM me if you need a contact in their engineering department. Nobody specific so far, just called the main line the other day and discussed options when my plan A fell through. Shooting you a PM for a contact. 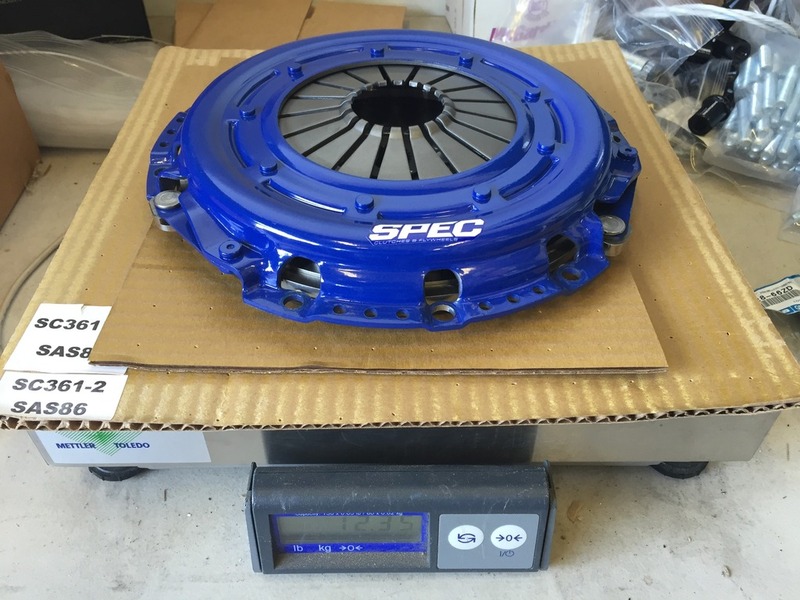 Flywheel is here from SPEC. 18.85 lbs. Clutch is on the way, takes a few days for them to build it once it's ordered. Interested to put that on the scale as well, if it weighs what I'm expecting then we'll be looking at somewhere around 15 lbs saved from the factory combo, but we'll see when it arrives. The flywheel isn't cheap but with the replaceable steel friction disc it should be infinitely rebuildable, never need to buy another one again. Came in at even less weight than I had expected, likely in part due to the rigid hub. 12.35 lbs. 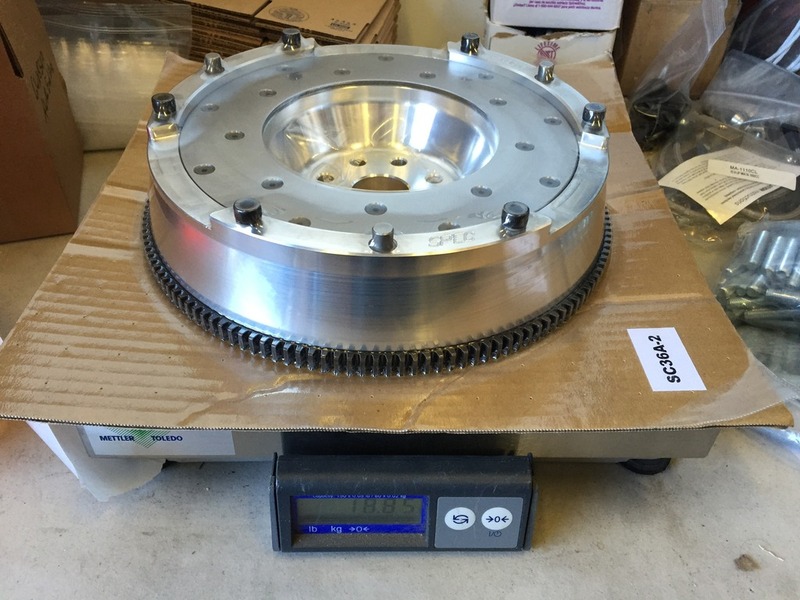 Combined weight with flywheel comes to 31.20 lbs, ~20 lbs lighter than factory clutch and flywheel combo. Possibly silly question: Why a rigid hub on what looks otherwise like a fairly civil, streetable clutch setup? There's no pilot bearing in the Camaro setup, so a sprung hub will self-destruct in short time. Because it is a rigid hub, the friendly organic solid disc was chosen so that it's still (hopefully) relatively easy to drive. A pucked disc with rigid hub would be a light switch, and with an est. 470 ft-lbs of capacity in the above setup, there's no need for a more aggressive disc anyways. Is this a stock thing, or an artifact of the aftermarket adapter?